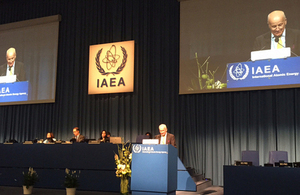 Professor John Loughhead, DECC Chief Scientific Advisor, delivers the UK statement to the IAEA annual conference in Vienna, Austria. The United Kingdom associates itself with the statement made by the distinguished representative of Luxembourg on behalf of the European Union. Let me first congratulate you on your election as President of this Conference and compliment the Secretariat on providing a first class service to Member States. its nuclear verification activities. While the agreements reached recently with Iran are dominating the headlines at the moment, the work to ensure States are complying with safeguards obligations is essential to the peaceful uses of nuclear material more generally. One of the priorities of the United Kingdom is to bring about a cost effective and secure transition to low carbon energy generation. We recognise the role that civil nuclear energy can play as a part of the energy mix to secure energy supplies and help meet international obligations to reduce carbon emissions in order to meet climate change goals. We will continue to ensure through Electricity Market Reform, the planning system for major infrastructure projects and independent regulation that we encourage companies to bring forward applications to build new nuclear power stations. Projects to build five new nuclear power stations are currently being taken forward. Two reactor designs that would be new to the United Kingdom are engaged in generic design assessment, a process that enables a full and comprehensive pre-approval of potential reactor designs before site specific authorisations are applied for, with benefits to costs, timeframes, and risks. Nuclear safety must remain our top priority. A nuclear accident anywhere in the world has the potential to affect us all. We need to address both the radiological impact of events and the impact they have on public confidence in nuclear. The UK is therefore pleased to note that an IAEA Operational Safety Review Team mission will be held at Sizewell B nuclear power station later this year – this mission will help to assure safety and build public confidence in the processes towards ensuring safety. There has been much activity at International, European and National levels to ensure that lessons from the Fukushima accident are learned and safety is, where it is proportionate to do so, enhanced. The United Kingdom has contributed to these efforts, including the strengthening of the Convention on Nuclear Safety processes. The UK aims for continuous improvements to nuclear safety. We are making publically available details of how the UK continues to work towards addressing the findings of the EU stress test exercise and our own reviews of the UK’s safety arrangements. We urge States that have not yet done so to provide the Secretariat with progress reports on the implementation of the IAEA Action Plan. Openness and transparency are key to ensuring the public remains confident in our ability to deliver safe nuclear power. We need to learn from each other, in particular on the issues of managing ageing nuclear installations and on improving public communication. The UK is also delivering a new national emergency planning and response programme, with government working closely with the nuclear industry, the regulator and local authorities, to ensure that emergency planning arrangements at all levels are robust and fit for purpose so that in the event of an emergency the response is integrated between the nuclear site, local areas, and national and international arrangements. The UK attaches great importance to understanding and countering the threat posed by those who seek to acquire and use nuclear and other radioactive material, or information, for terrorist and or malicious purposes. We strongly support the central role of the IAEA in the international nuclear security architecture, including in the coordination of international assistance. I am therefore pleased to note that the UK Government has already, this year, made an extrabudgetary contribution of over £5.8M pounds to the Nuclear Security Fund, making the UK the second largest Member State Contributor to the Fund. The UK seeks to contribute fully to international discussions on nuclear security. We will play a full role in the Nuclear Security Summit to be held in Washington DC in March 2016. The UK also warmly welcomes the announcement of the next IAEA International Conference on Nuclear Security, to take place in December 2016. We continue to call upon States to adhere to the Amendment to the Convention on the Physical Protection of Nuclear Material and welcome planned Agency activities aimed at promoting its early entry into force. Peer reviews by international experts play a key role in nuclear security, and we are pleased that the IAEA will send another Mission from the International Physical Protection Advisory Service to the UK in 2016 to review security arrangements. We recognise the increases in efficiency and effectiveness that digital technologies can provide to the nuclear industry, but are also acutely aware of the risks inherent with computerised systems including from malicious actors. We welcome and support the work of the IAEA and the wider international community to develop common guidance on cyber protection, and we call upon states to act upon the risks inherent with digital technologies. In particular, we congratulate the IAEA for organising the International Conference on Computer Security in June 2015. The United Kingdom also looks forward to the Agency’s continuing implementation of its Nuclear Security Plan. We have continued to support the provision of assistance where required, including through the central role of the Agency in facilitating international cooperation in supporting the efforts of States to fulfil their responsibilities to ensure the security of civilian nuclear and other radioactive material. The IAEA plays an essential role in verifying States’ compliance with safeguards obligations. We call on all non-nuclear weapon States that have not yet done so to bring into force a Comprehensive Safeguards Agreement and an Additional Protocol - the current verification standard. It is essential for IAEA safeguards to develop continuously, both to address new challenges and to learn from experience gained. The United Kingdom welcomes the progressive development of State-level safeguards approaches, which make greater use of the ability of the IAEA to consider the State as a whole. Such approaches are consistent with existing safeguards agreements and, where applicable, additional protocols and provide an optimal approach to safeguards that will strengthen effectiveness and increase efficiency. Mr President, addressing nuclear safety, security, and safeguards is fundamental to the safe growth of civil nuclear energy in future. The NPT remains in place and the lack of consensus at the 2015 Review Conference does not change anyone’s obligations under it. We remain strongly committed to the Action Plan agreed at the 2010 NPT Review Conference. The UK remains committed to supporting the IAEA’s Technical Cooperation Programme. The Programme provides the necessary support to allow countries to use nuclear techniques in a safe and effective way. The impact that the Programme has had should not be underestimated. We welcome the continued implementation of the Results-Based Management approach, and encourage the implementation of further measures, such as employing well established project management techniques to oversee projects to demonstrate value for money and help ensure success. The Agreement reached in Vienna on 14 July between the E3/EU+3 and Iran on a Joint Comprehensive Plan of Action is historic. The full implementation of this agreement will provide a long lasting, peaceful solution to the Iranian nuclear issue, providing confidence in the exclusively peaceful nature of Iran’s nuclear programme. It represents a significant achievement for diplomacy and will contribute positively to both regional and international peace and security. We call on the international community to support its implementation, including through financial contributions to enable the IAEA’s essential task of monitoring compliance with this deal. As with previous requests for extra budgetary funding on this matter, the UK will make a substantial financial contribution towards this work. The UK welcomes the “Road-map for the clarification of past and present outstanding issues regarding Iran’s nuclear programme” under the Framework for Cooperation, concluded between the IAEA and Iran. We look forward to the DG’s final assessment on the resolution of all past and present outstanding issues by 15 December 2015. We urge Iran to cooperate fully with the IAEA to make the necessary substantive progress on all outstanding issues, by 15 October as set out in the Road-map. It is now four years since the Board of Governors resolution on Syria’s non-compliance with their IAEA Safeguards agreement. We continue to urge Syria to give the IAEA full disclosure and the cooperation that it has promised. The UK continues to be deeply concerned by the DPRK’s continued lack of co-operation with the IAEA. We call on the DPRK to resume co-operation with the Agency, comply immediately with all relevant UN Security Council Resolutions, and refrain from any further provocative actions. In summary, Mr President, the United Kingdom values all of the work undertaken by the IAEA and would highlight in particular the assistance provided in the safe and secure development of nuclear energy, in improving safety and security standards worldwide and in ensuring that States are complying with their safeguards obligations. That concludes my remarks and I wish you and the conference every success. Professor John Loughhead is Chief Scientific Advisor at the Department of Energy & Climate Change.